Lupus has long been represented by two mascots: wolf & the butterfly. The word ‘Lupus’ (Lupus- wolf in Latin) was coined by a thirteenth century Physician Rogerius as the facial lesions in Lupus looked like wolf bites. The butterfly as a mascot has its origin in the butterfly shaped malar rash seen in SLE. There have always been debates regarding the ideal mascot for lupus. The wolf is a sinister, cunning animal. It aptly represents what Lupus can do to a person & also represents the origin of the name. However, as a mascot, it has a negative impact. As against this, butterfly is beautiful & represents vitality. Many have even compared the life history of a butterfly emerging from a cocoon to a Lupus patient emerging with flying colors from a flare. As I was reading the journal Lupus the other day, a beautiful explanation held my attention. 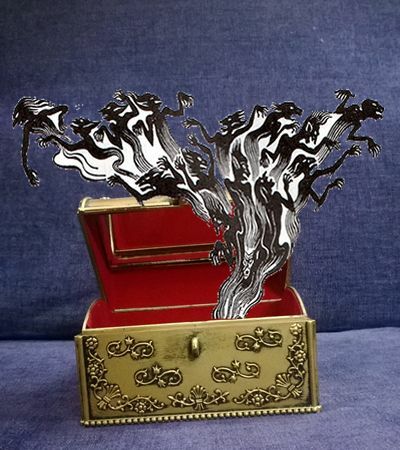 The author MJ Fritzler has highlighted the Greek mythological story of the Pandora’s box in an article. According to the Greek mythology, Zeus, the father of the Gods & men, ordered Hephaestus, the God of craftsmanship to create Pandora, the first woman on earth. She was endowed with many gifts: clothed Athena, endowed with great beauty by Aphrodite, and eloquent speech by Hermes. After Prometheus stole fire from heaven, Pandora was given a beautiful container by Epiphemus. Pandora was given explicit instructions not to open the container under any circumstance. However, another of her God given traits, curiosity eventually got the better of her & she opened it only to find that all evil escaped & invaded the entire earth. Realizing her error, she tried to make amends by closing the container, but the entire contents had escaped, except for one thing- a winged creature with iridescent wings – the personification of Hope named Elpis. This story would aptly describe what a Lupus patient goes through. Once diagnosed, it seems like the Pandora’s box is opened because ‘all evil’ seems to break loose. It is the butterfly that gives the hope. Indeed, over the years, the butterfly has brought hope to lives of Lupus patients & the prognosis has improved significantly.